"Whither I go, thou canst not follow me now; but thou shalt follow me afterwards" (John 13:36). He was going to the Cross. They would also be going the way of the cross, but not just then. He would pay the penalty for their sins and ours. They would later proclaim to the world that Jesus fulfilled divine justice, thereby making the way for mankind to be reconciled to God. "Let not your heart be troubled: ye believe in God, believe also in me. In my Father's house are many mansions: if it were not so, I would have told you. I go to prepare a place for you....I will come again, and receive you unto myself; that where I am, there ye may be also" (John 14:1-3). Jesus was speaking to them in terms that were comforting but at the same time perplexing. Though the Gentile mind may not grasp it, His words pictured a wedding that would take place. His part was that of the Groom; their part would be that of the bride. As it was with most of what Jesus had taught them in their short number of years together, they missed the significance. That would all change, however. Following His departure, the Holy Spirit would take up residence within them and give them understanding. "These things have I spoken unto you, being yet present with you. But the Comforter, which is the Holy Ghost, whom the Father will send in my name, he shall teach you all things, and bring all things to your remembrance, whatsoever I have said unto you" (John 14:25-26). Better yet, and amazingly so, their relationship with Jesus would be far more personal and intimate than when He walked with them. The Holy Spirit would indeed bring to their "remembrance" Jesus' words pointing to a future wedding, and the disciples' increasing love for Him would echo a bride's desire to be with her husband-to-be. In other words, the disciples would embrace the reality that they are the bride of Christ. Since true believers in Jesus are disciples of the original disciples, what Jesus had to say to them in John 14:1-3 certainly applies to those of us who have likewise believed upon Him. We are the bride. He has prepared a place for us in heaven. One day, he will return for His bride. 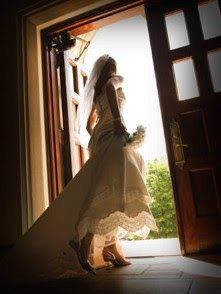 In the custom of the ancient Jewish wedding, when the groom left the bride to prepare a place for her in his father's house, she went about making her own preparations for the wedding and her life with her husband-to-be. There's little doubt that her excitement increased as the day of his return drew near. What, then, about "we, the bride"? Are we increasing daily in our excitement as we anticipate the coming of our Lord, our Savior, our Groom, our Blessed Hope? If not, there is something terribly wrong. What might put that excitement off? Perhaps some are only infatuated with Jesus. Although they call themselves Christians, He's like spiritual eye candy that they find attractive in vague "spiritual" ways - but there are too many specific things about Him that they don't care for. Submission is at the top of their "can't take Him too seriously" list. Jesus did, after all, pose the question, "And why call ye me, Lord, Lord, and do not the things which I say?" (Luke 6:46). Their commitment may never have involved giving their heart fully to Him through belief in His death, burial, and resurrection as the only One who could pay the complete penalty for their sins. They were never born again, a criterion Jesus said was necessary for entering the kingdom of God (John 3:3). There is neither an engagement nor a wedding for such folks, nor could there be. As for those who are truly saved by faith, their affections for Him may have been hindered or cooled down by two common obstacles: their love of themselves and their love of the world. That won't prevent the wedding, but it plays havoc with the bride's preparation. Preparation? Some don't seem to be aware that every believer is going through a preparation of readiness for the day when he or she will see the Lord. The preparation time involves a myriad of things related to our growth in love for Jesus: sanctification, i.e., truly being set apart for Him; growth in our desire to obey and please Him; thankfulness for His choosing us; increasing fruitfulness in our lives, and joyfulness and excitement in our expectation of seeing Him. The Word of God is filled with the bride's preparation instructions. Sadly, the interest in reading and applying what the manual says is on the wane for many of the betrothed. "...abide in him; that, when he shall appear, we may have confidence, and not be ashamed before him at his coming" (1 John 2:28). "But thou, O man of God, flee [sinful] things; and follow after righteousness, godliness, faith, love, patience, meekness. Fight the good fight of faith, lay hold on eternal life, whereunto thou art also called, and hast professed a good profession before many witnesses. I give thee charge in the sight of God...that thou keep this commandment without spot, unrebukeable, until the appearing of our Lord Jesus Christ" (1 Timothy 6:11-14). "Wherein ye greatly rejoice, though now for a season, if need be, ye are in heaviness through manifold temptations: That the trial of your faith, being much more precious than of gold that perisheth, though it be tried with fire, might be found unto praise and honour and glory at the appearing of Jesus Christ: Whom having not seen, ye love; in whom, though now ye see him not, yet believing, ye rejoice with joy unspeakable and full of glory: Receiving the end of your faith, even the salvation of your souls" (1 Peter 1:6-9). There is no task, no circumstance, no condition, no problem, no event, no person (other than ourselves!) that can rob us of the joy we have in Christ, especially when we remember that "neither death, nor life, nor angels, nor principalities, nor powers, nor things present, nor things to come...shall be able to separate us from the love of God, which is in Christ Jesus our Lord (Romans 8:38-39). Then we can joyfully fulfill the preparatory works "which God hath before ordained that we should walk in them" (Ephesians 2:10). "For this cause we also, since the day we heard it, do not cease to pray for you, and to desire that ye might be filled with the knowledge of his will in all wisdom and spiritual understanding; That ye might walk worthy of the Lord unto all pleasing, being fruitful in every good work, and increasing in the knowledge of God; Strengthened with all might, according to his glorious power, unto all patience and longsuffering with joyfulness" (1:9-11). "Heaven and earth shall pass away, but my words shall not pass away" (Matthew 24:35; Mark 13:31; Luke 21:33). Ours is a "heavenly calling" (Hebrews 1:3). We have been "blessed with all spiritual blessings in the heavenly places in Christ" (Ephesians 1:3); and it is in heaven that God has reserved for us "an inheritance, incorruptible, and undefiled and that fadeth not away" (1 Peter 1:4). Indeed, our hope is in heaven (Colossians 1:5) where our names have been written (Luke 10:20). No wonder, then, that our resurrection bodies are "spiritual" (1 Corinthians 15:44) and "heavenly" (v. 49; 2 Corinthians 5:2), suited for living in God's presence. "In thy presence there is fulness of joy; and at thy right hand are pleasures for evermore" (Psalm 16:11). Growing up Roman Catholic, which involved a continuous and somewhat extensive Catholic education, I was never taught that I was the "bride of Christ"; that was reserved for the nuns. Neither was I taught that Jesus was coming back to take me to heaven. Those who were brought up in churches that strongly adhere to the teachings of the Reformation would most likely be just as uninformed as I was and perhaps even opposed to the doctrine of Christ returning to catch His bride away to heaven. Although the Reformers rejected the false gospel of Rome, they kept some of its baggage, such as infant baptism and particularly its eschatological teaching of amillenialism, which practically dismisses the return of Jesus for His bride. The sad irony here is that the cry of the Reformation was sola Scriptura, meaning that the Bible is the believer's only authority on matters of faith and practice. Does the Bible indeed teach the return of Jesus to catch away His bride in order to take her to heaven for the wedding and the feast that He has prepared? Or, as the critics charge, is that the delusion promoted by a 19th century anglo-Irishman named John Nelson Darby? Darby claims that the teaching came from Scripture (see For Zion's Sake, offered in our resource section). The critics and the mockers of this teaching, even in our day, say no. Darby aside (although I believe we owe him a great deal of thanks for encouraging the church to seek out what the Scriptures tell us about this matter), as Bereans, let us "search the Scriptures" to see if these things be so. As we began this article, Jesus was declaring to His disciples that He was going away to prepare a place for them and said that He would return. The metaphorical context clearly implied a wedding. How might that take place? "Behold, I show you a mystery; We shall not all sleep, but we shall all be changed, In a moment, in the twinkling of an eye, at the last trump: for the trumpet shall sound, and the dead shall be raised incorruptible, and we shall be changed" (1 Corinthians 15:51-52). "For the Lord himself shall descend from heaven with a shout, with the voice of the archangel, and with the trump of God: and the dead in Christ shall rise first: Then we which are alive and remain shall be caught up together with them in the clouds, to meet the Lord in the air: and so shall we ever be with the Lord. Wherefore comfort one another with these words" (1 Thessalonians 4:16-18). "Let your loins be girded about, and your lights burning; And ye yourselves like unto men that wait for their lord....Blessed are those servants, whom the lord when he cometh shall find watching....Be ye therefore ready also: for the Son of man cometh at an hour when ye think not" (Luke 12:35-37, 40).